There are more than 126,000 contaminated sites in the U.S. You see them coming a mile away, particularly geologist and engineers who enjoy a good cleanup. 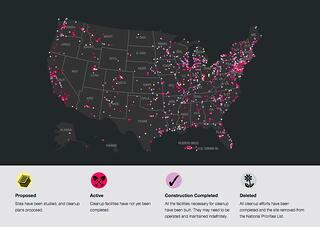 There are another 450,000+ brownfields. If you are reading this article and make over $5,000,000 a year, your chances of getting audited by the IRS are about the same as finding a brownfield that is actually contaminated, about 20%. Most people also know a brownfield when they smell it and take proper measures to see whether or not their site is one of the 90,000 with a catch. The point is we have come a long way since the last time the Cuyahoga River burned. Regulations were passed governing the cleanup of places contaminated with hazardous substances, nuclear and hazardous waste. Instead of millions of polluted sites and rivers that catch fire, we now have a crisp and refreshing blend of malt and hops, a lot of environmentally safe real estate and a host of tools to spot properties that might not be. Despite all this progress you have to look sharp and never become complacent. In the movie The Firm, there is a scene in which security chief Bill DeVasher, played by Wilford Brimley, is arguing with Gene Hackman’s character Avery Tolar. Tolar: Wouldn't you lie about having a felon in the family to get a job like this? DeVasher: He ought to be kept on a short leash. Tolar: Why? You've got nothing to be suspicious about. DeVasher: I get paid to be suspicious when I've got nothing to be suspicious about. Here is an example in which there was “nothing to be suspicious about.” It was strange that water supply wells in the area still contained PERC. So it seemed odd a facility undergoing RCRA Corrective Action as a result of a 3008(h) order, no less, was getting ready to cross the finish line. Yet after decades of work and years in post-closure care, things were about to be over. The plant had spent millions of dollars remediating the source, the terms of the order had been met, and the monitoring of “clean” groundwater was all that stood between the site and a certificate of closure. So why wasn’t it “clean” like it ought to be? It seemed the agency and its customer, the plant, were on the same page. A few more reports and they were finished. Nothing to be suspicious about here—except for two little lines in the 30-year-old, barely legible copy of a fax of that order. The upshot: The same solvents found in the water wells had also been used to clean plant floors. The rinse material was discarded on the ground outside the buildings and in the septic system. Turns out the solvent reclamation operation in a different part of the plant—the historical focus of the Corrective Action— was one part of the problem. The monitoring well network was monitoring the wrong areas of the aquifer. It was back to square one. Things have certainly improved over the past 50 years. We may never again see a river ablaze, but the small stuff can still catch you up. Stay suspicious.